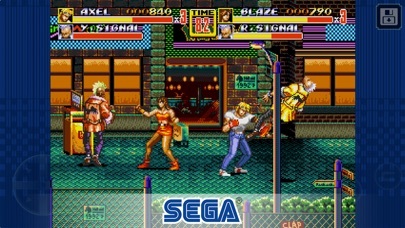 - Four playable characters, each with unique ‘blitz’ attacks, capable of dealing incredible damage to your enemies. - Insane cast of end-of-level and mid-level bosses, from jet-pack fuelled psychos, to ‘Big Ben’, the lumbering fire-breathing brawler! - Eight side-scrolling levels to tussle through – from amusement parks, to munitions dumps, until you reach the Syndicate stronghold itself! SAVE YOUR GAMES – save your progress at any point in the game. - There's no need to fight the jetpack-weilding boss Stealth in Stage 6 – focus your attention on Souther instead!